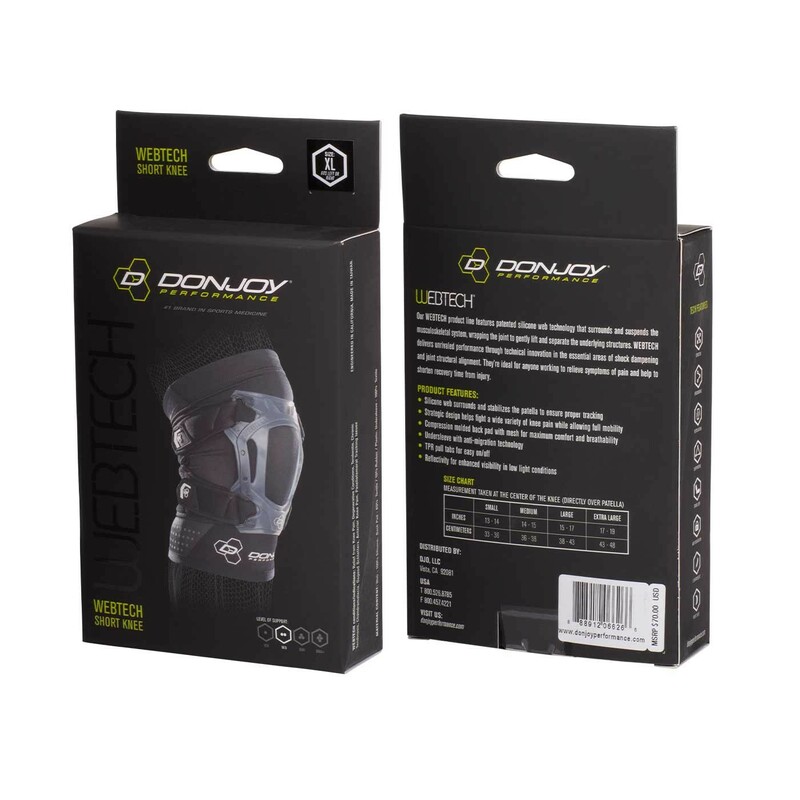 Our DonJoy Performance Webtech Short Knee Brace features an innovative three part system that is ideal for relieving common forms of knee pain often associated with sports injuries, overuse injuries and degenerative conditions. Specifically, the Short Knee features a unique web structure that evenly distributes pressure over the Quadriceps and Patellar Tendons, and helps to stabilize the patella and ensure proper tracking. 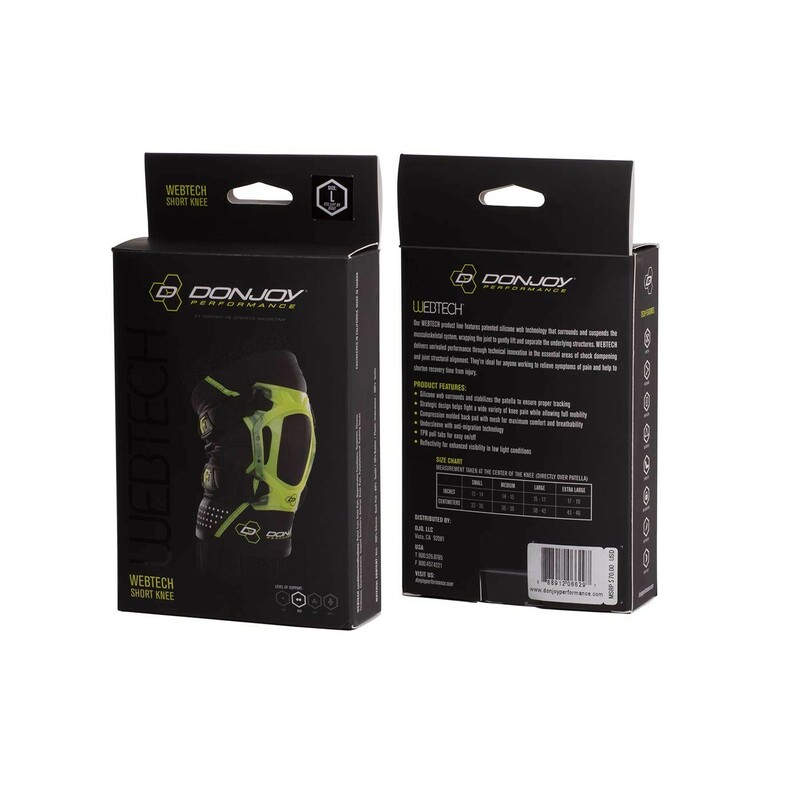 Compression molded back pad adjusts easily to optimize fit and comfort, and a four way stretch lycra/mesh undersleeve eliminates hot sports and provides an added layer of protection. Compared to the Webtech Knee Brace, the Short Knee is approximately 50% shorter which makes it ideal for relieving pain often associated with tendonitis, commonly referred to as runner's and jumper's knee. Hi, Is the Webtech good for water sports, like wakeboarding? This brace can be worn in the water. We always recommend rinsing the brace with water and allowing the brace to air dry completely between uses. Will this help with severe patellar tendinitis? This brace will help as it will put prssure on the tendon that hurts to reduce the stress its puts on the bone, as well as the webbing will act as a shock absorber. Is your webtech knee short knee brace good for both left and right knee? I want them for patella stability of my left knee and for support of my right knee due to arthritis behind the top of my knee cap that cause some pain. Yes, the brace is universal you can wear it on either knee. thanks for contacting Donjoy Performance. which has a bit of patella padding. 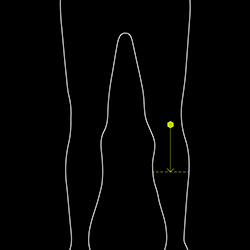 I've had meniscus repair 3 months ago, but still feel discomfort & tightness in and around the knee. I've also had treatment for ITBS. Is the Webtech short knee brace enough support? I am trying to remain as active as prior to the knee surgery with running and cycling. My 14 year old daughter needs a brace to wear during hockey (goalie). She has patella femoral tracking problems with pain. She needs a brace that will stay in place during activity. As a goalie, it may be better for her to to try the Tru-Pull Lite, https://www.betterbraces.com/donjoy-tru-pull-lite, which is a bit stronger brace for that type of activity. 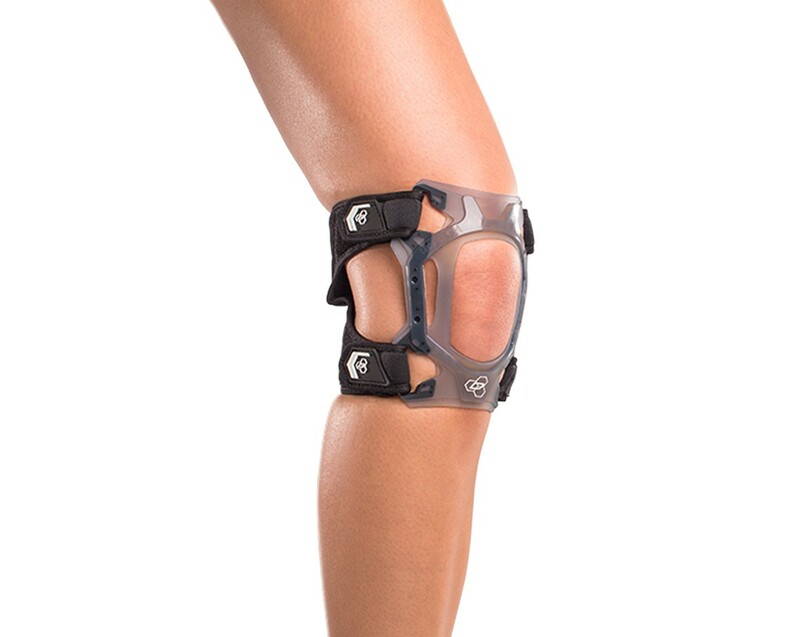 I am looking for the Webtech Short Kneebrace in extra small, but cannot find it online. Where can I find an extra small? Thank you. Hi, I have had an ACL recon years ago and wear a knee brace. However, I am looking for extra support for my aching patella. Would the short webtech with the padded anaform sleeve as a combination be a good option to help my patella and also provide some knee joint stability? I have knee cap instability/patellar subluxation. It slips out from time to time when I pivot or turn during lacrosse. What is the best recommended brace option for me? The Webtech knee is one option for your knee. 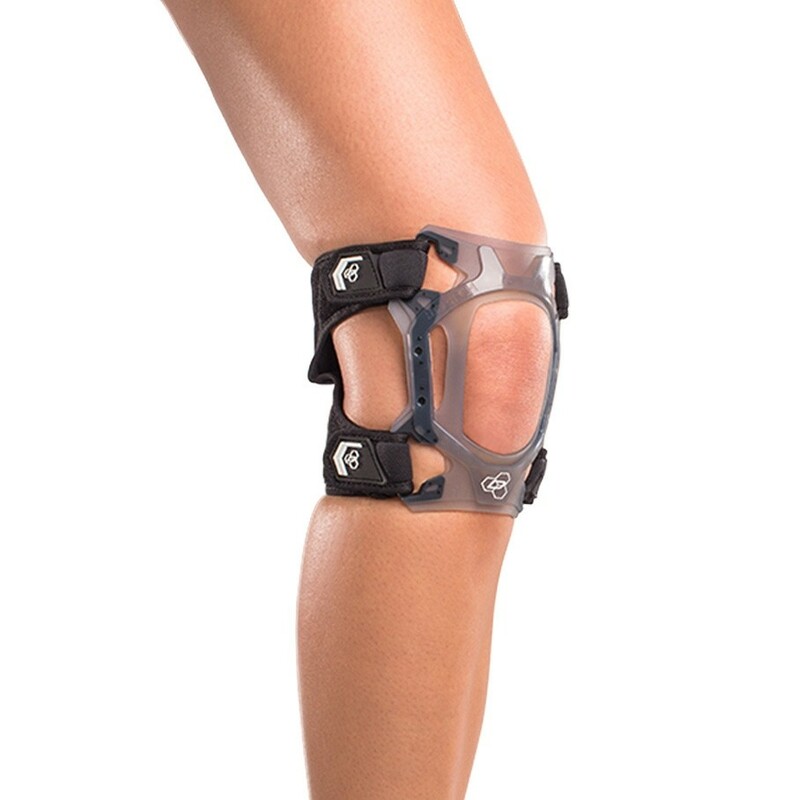 The brace will help to stabilize the kneecap and reduce pain in front of the knee. I have moderate patellofemolar compartment OA with assymetric joint space loss laterally and osteophyte formation and mild medial compartment OA. Do you recommend this brace or another? I play slow pitch softball and I am the catcher. How does this brace effect or hold up to the squatting into a catcher position and reaction time of jumping up for plays? I have pain of the knee cap and swelling of the patella. Will this help with that pain? I had an impact fracture on the outside of my left knee one year ago and a MCL stage II tear (no surgery). From time to time while bowling or playing golf my knee fatigues to a point where it collapses. Which brace would help? 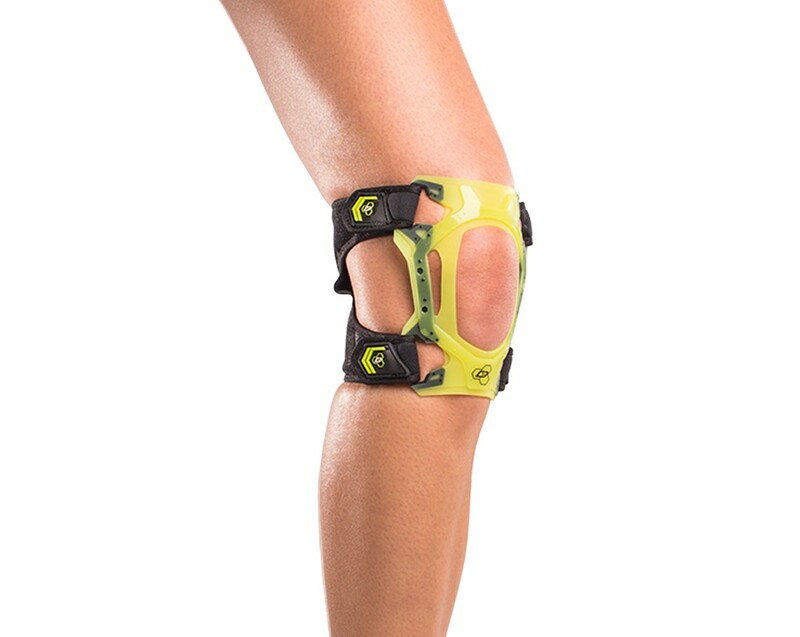 The Webtech Knee Brace should provide you will general support and help with any anterior knee pain that you may get. I would suggest the longer brace for you. The Webtech Knee would give the support you need for the meniscus. Is this the right brace for providing support for olympic style weightlifting? I have gone through a few different knee braces for Chondromalacia and they all seem to slide down my leg after some time. Would you recommend this brace, or any other, to combat that? I really want one that stays in place. Thanks! 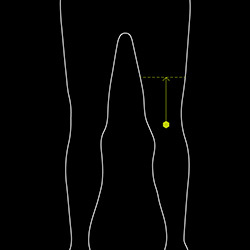 I have patellofemoral pain syndrome which affects the medial side of my patella when I go into a low squat position. I'm a varsity level rower so I need something extremely lightweight/has the least amount of fabric covering my knees. This brace looks like it's the best in terms of weight and comfort, but will it provide adequate support? Does this brace come with the under sleeve for the $70 price? I have chronic patellar tendonitis(after this long it would be considered tendinosis maybe??). several years of pain off and on, mostly on. Any type of quick or sudden move tends to set it off. I am trying to choose between this and the webtech knee strap. I have a donut style patella knee brace(Mueller or Mcdavid) and it doesn't seem to provide much relief for me and this looks to be a similar mechanism, but perhaps a bit stronger stability. Thoughts or suggestions? Sounds like you might need a bit more support than just a patellar strap. 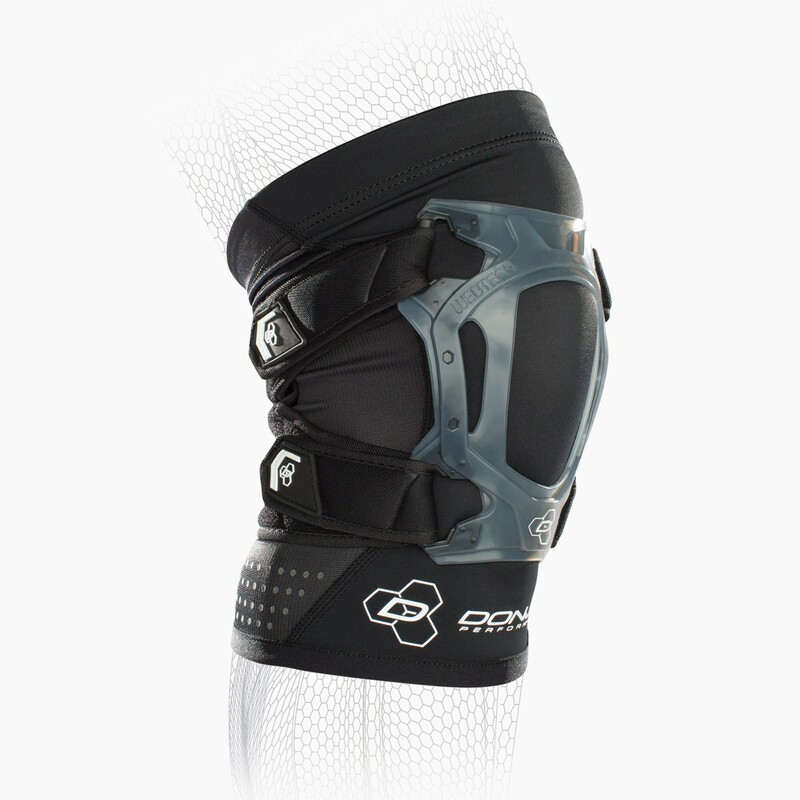 The Webtech Knee Brace will provide more support to the front of the knee and the pattelar tenson. The webing absorbs force and dispeares it within the leg to decrease anterior knee pain. I have medial subluxing of kneecap after a fulkersons procedure. I currently use the woman's defiance III with a tru pull attachment. I am wondering if the smaller webtech short knee brace will give the same level of protection for the mal tracking that the bulky defiance with tru pull attachment gives. Thanks! 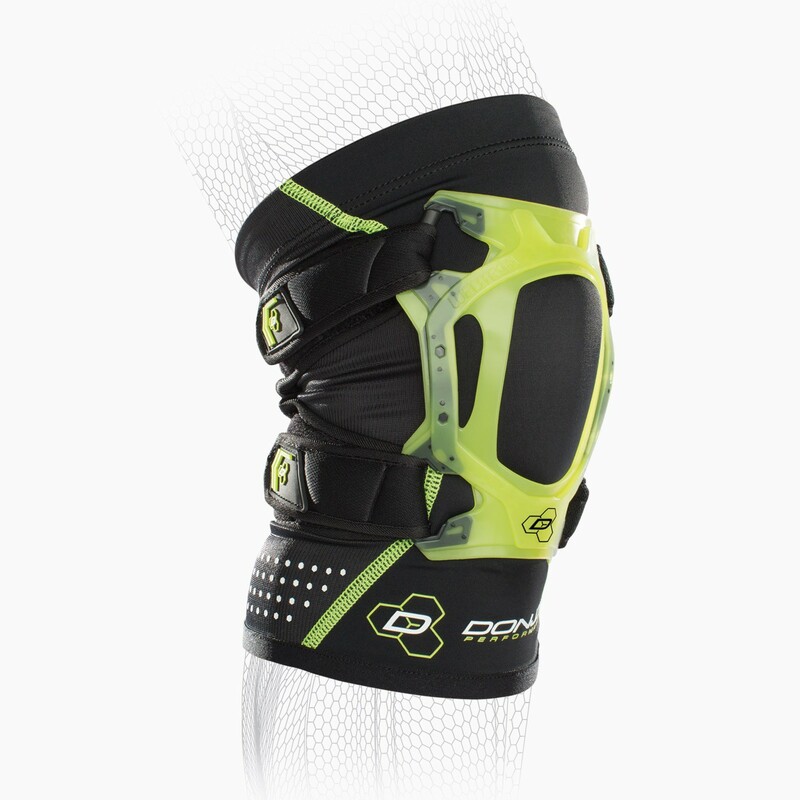 The WEBTECH SHORT KNEE BRACE only offers a MILD support compared to the DEFIANCE. Having recently been diagnosed with torn cartilage behind the knee and advised by the doc to wait two weeks to see how things go before considering surgery. So I needed something to help me walk and negotiate the stairs, which causes significant pain. I purchased several braces which only helped minimally. My wonderful sports-savvy daughter sent me this brace which arrived this morning. My legs and calf are small, and the Size Small short knee brace fits perfectly. I have been able to walk without limping but haven't yet negotiated the stairs. Fingers crossed! Pros: Comfortable snug fit; easy to put on/take off. Rubberized web surrounds allow movement, yet keep the knee/ligaments in check. Cons: Actually, I needed a magnifying glass to read the instructions! Really? The instructions over-complicate and confuse how to secure the brace. Just look at the photo and you'll quickly figure it out. Good grief; so easy! I had a patella dislocation and have tried roughly a dozen different braces throughout my recovery and I have to say that this has been the most comfortable one. I do have to say that I don't wear the sleeve, I find it more comfortable without the sleeve. Pros: Great patella support. Comfortable and breathable. Cons: The material on the back should have been more stretchable/flexible. 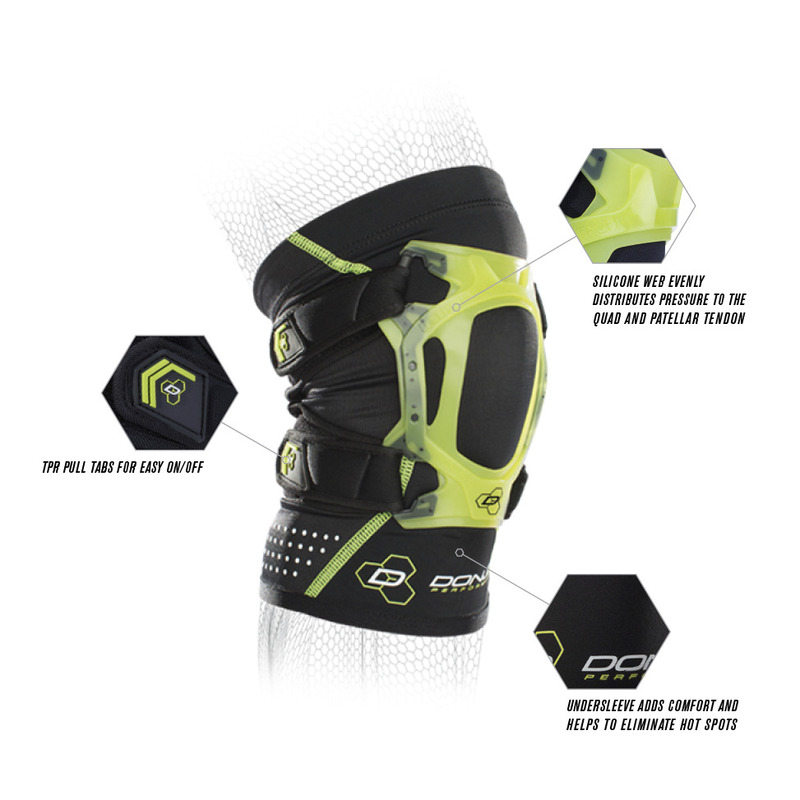 This knee brace is very practical and functional for patellar subluxation. 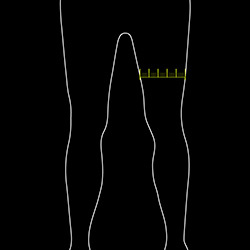 The open knee area is large enough to support the patella/knee cap without putting pressure on. The velcro allows for adjustment to get a secure fit. It is sleek enough to fit under most clothing. It is not bulging and looks ok, for a knee brace. It seems to provide good support but has a tendency to slip down during use. It chafes somewhat behind the knee, even with the optional sleeve. I used about 10 times but still not sold on it. Pros: Supports the knee well. Cons: Uncomfortable rubbing behind the knee. Some difficulty keeping it in place. Followed the questionnaire online and thought this brace sounded like the answer. I have tried it off and on for the last month and it seems to irritate it more than help it. its good for running, reduces some of the impact.... K tape works better. Cons: doesn't fit well in back of knee area. I have patellofemoral pain with mild chondromalacia. I bought the donjoy short knee brace because my physical therapist recommended swimming, but kicking with my legs in the pool was somewhat painful for my sore knee. With the brace, I can swim very comfortably. I don't really notice it while I am in the water. I do not use the included cloth sleeve in the pool. The brace gives good support even though it is small and light. It is easy to put on and adjust, and stays put even when wet. It does not rub or irritate my skin. After swimming, I just put the whole thing in the wash. The front part is plastic, but the back part is a slightly padded material that absorbs pool water. After washing, I hang it up to dry. It is soon ready to go for the next day. I have been swimming in this brace for about a month. So far, it has held up well. 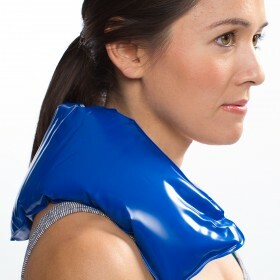 Pros: Light, easy to adjust, stays in place during vigorous activity, REDUCES PAIN!!! I have bi-lateral patellofemoral dislocation with lateral and medial damage to one knee. I have purchased multiple braces and of all the braces, the short web tech braces have allowed for better walking, lower pain in both knees, and my swelling is minimal. Braces came with inserts and can be worn with or without the included inserts, I prefer to wear the braces without the inserts. 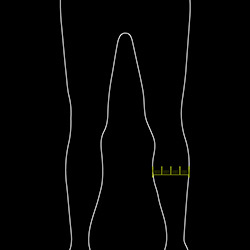 The braces do exactly as described, they keep my patellas in place. Prior to using this light weight brace I could only walk limited distances and stand for short periods of time, the use of these braces have helped me stand for longer periods and walk for longer periods. Although I still do feel pain, the pain is not as bad as prior to using these braces (L&R). The braces also do not cut off circulation. I do recommend the short web tech brace, they are light and allow for good range of motion and after a while you don't even feel like your wearing a brace. Cons: The insert can be tight and cause swelling Wish the insert came in size medium/large instead of either medium or large. I'm so disappointed in this. The velcro straps are ridiculously short, so the top doesn't really fit, but the straps aren't long enough to put it where it ought to be. The back part is also too long so it folds and creases in a really awkward and uncomfortable way. I would also recommend ordering the next size up if you must order this, because the size chart is wildly inaccurate. The sleeve would also be way better with out the "stay put technology" aka rubber dots. All that does is roll down on you and strangle your leg. Cons: Not made for human legs. I use it to play tennis and it allows me to play pain free. Pros: Tracks the Patella well and is not cumbersome. Cons: The Velcro straps sometimes does not stay put.